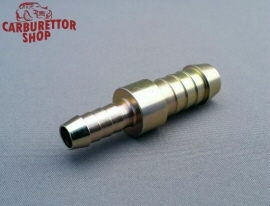 Metal Fuel Line Adapter 8 mm - 12 mm. This is coupling to connect two pieces of flexible fuel line. This concerns one fuel line with an internal diameter of 8 mm and one with an internal diameter of 12 mm. Adds a mere 9 mm to the length of your fuel line. Despite the barbed ends, we do advise you to use our premium quality jubilee clips to secure your fuel line onto this adapter.